I’m old enough to remember when ordering a pizza meant digging out the yellow pages and calling the guy. If you were having a party, you’d have to shout into the phone and try to ignore Fred’s repeated request for artichokes. (Who invited Fred anyway?) Then you’d sit back and wait, patiently or not, until the guy finally showed up with your precious little miracle. Now there’s an app for that, of course. A really cool app, actually. The Domino’s Tracker. 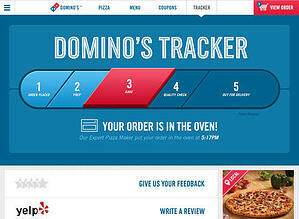 The Domino’s Tracker lets you see exactly where your pizza is in the delivery and preparation process. Just a glance at your phone or PC tells you everything you need to know. Not only is the app useful, it’s fun and it makes the process much more personal. I enjoy imagining my pizza getting all hot and bubbly in the oven. Of course, my pizzas have always been cooked in an oven, but the app makes me feel more engaged and emotionally invested. Here’s an interesting fact, if information is presented orally, we remember only about 10% three days later. However, if there is also a picture, that figure goes up to 65%. Why? Humans are wired to experience the world visually. Think about written words. What is a word, if not a series of images? To process a word, your brain must recognize each of the images, and figure out what they mean in context of each other. So, my brain must process six images in order to understand the written word “pencil,” but only one to recognize a photo of a pencil. This explains why one study showed that folks who used visual presentation tools to convey information were 43% more successful than those who didn’t. The same principles of visualization and transparency that make me feel more connected to my pizza can be used to help managers and team members feel closer to improvement work. It is one thing to read about work being done to improve the organization, it is quite another to see forward progress. There are lots of ways to visualize improvement. Huddle boards make it easy to follow improvements as they move from one stage of work to another. Kanban boards shine a bright light on roadblocks and backlogs. Impact summaries make positive results stand out, and executive dashboards give leaders instant insight into the health of the improvement culture. Domino’s isn’t the only consumer company to use visual management to convey information to customers. FedEx has a similar visual tracker for packages. Uber lets you watch your driver on GPS as she gets closer to your location. They all understand that showing you what is happening is much more effective and emotionally powerful than simply telling you. If you want your team to be more informed, active, and engaged when it comes to improvement, why not put the visual management approach to work for you?